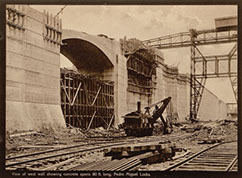 After the French failed to build a Canal on the Isthmus of Panama, the United States began their construction efforts in 1904. Construction of the Canal included three distinct construction divisions: the Atlantic Division which worked from Limón Bay to Gatún; the Central Division which ran from Gatún to Pedro Miguel; and the Pacific Division which worked from Pedro Miguel to the Panama Bay. The varying differences in topography and terrain required specialized equipment and engineering ingenuity to complete the task. Excavating the Panama Canal involved the removal of over 300 million yards of rock and dirt. For this, the Americans purchased 102 new, railroad-mounted steam shovels. In 1907, the construction fleet also included 560 drills, more than 50 cranes, 20 dredges, giant hydraulic rock crushers, cement mixers, and pneumatic power drills; nearly all of which were manufactured to include the latest technology developed in the United States. 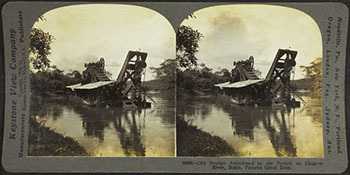 Old Dredge Abandoned by the French on Chagres River, Bohio, Panama Canal Zone. 1907. Stereograph. 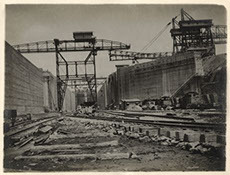 2013.2.92 Panama Canal Museum Collection, George A. Smathers Libraries. Gift of Bill Angrick. The obsolete French paddle wheel dredges were no match for the enormous digging capacity of the American steam shovels which replaced them. The paddlers faced an unpleasant ending as they lay rusting away, submerged in murky water. Miraflores Locks Construction Site. 1913. Gelatin silver print. 2013.1.497 Panama Canal Museum Collection, George A. Smathers Libraries. lift and move heavy loads over a wide expanse. This type of crane was normally mounted on rail trucks and was capable of being moved or repositioned as needed. 208 1/2 ft. of East Side Wall Completed. 1910. Gelatin silver print. 2013.8.100 Panama Canal Museum Collection, George A. Smathers Libraries. Gift of Dusty Graham and Ann Lafferty. I.C.C. 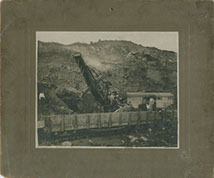 1201 Bucyrus Steam Shovel with Workers. Gelatin silver print. 2004.027.803 Panama Canal Museum Collection, George A. Smathers Libraries. Gift of Pat Bjorneby. At the time of its debut, the Bucyrus 95-ton steam shovel was marketed as the most powerful ever built. Being able to mass-produce such a capable machine afforded Bucyrus the rights to 77 of the 102 steam shovels used in the construction of the Panama Canal. 80 ft. Long, Pedro Miguel Locks from Pictorial Panama Canal. 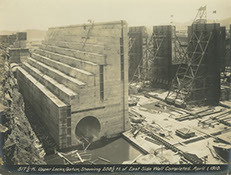 2004.027.784 Panama Canal Museum Collection, George A. Smathers Libraries. Gift of Pat Bjorneby. A Bucyrus steam shovel is on standby, below the lock’s west wall, awaiting the return of the spoil train. Construction debris is then loaded onto flat cars and hauled to a disposal site.